The beautifully crafted Storkcraft Hillcrest Fixed Side Convertible Crib has a modern look and design that is both trendy and functional. Not only does this crib look great but the Hillcrest will grow with your child as it can be converted to a day bed and full size bed providing your child with years full of enjoyment. The Storkcraft Hillcrest crib is made from quality and attractive wood and wood products and will safely fit any standard size crib mattress. This crib also features three height adjustable mattress levels for your convenience. All Storkcraft cribs are JPMA Certified and PTPA (Parent Tested, Parent Approved) Approved. JPMA Certified. Meets or exceeds all U.S. & Canadian safety standards. 4 adjustable mattress support positions to accommodate your baby's growth. Easy to assemble with permanently attached instructions. With a simple modern design and beauitiful two-tone finish, The Graco Maddox 4-in-1 Crib is the perfect choice for any nursery. The Maddox is a low profile crib that provides easy access to your baby while adding style to your baby's room. The Graco Maddox Crib is versatile and will grow with your child as it transitions into a toddler bed, a daybed and a full-size bed providing your child with years of enjoyment.The Graco Maddox crib is JPMA certified and is compliant with all CPSC and ASTM safety standards to ensure the safest sleeping environment for your child. 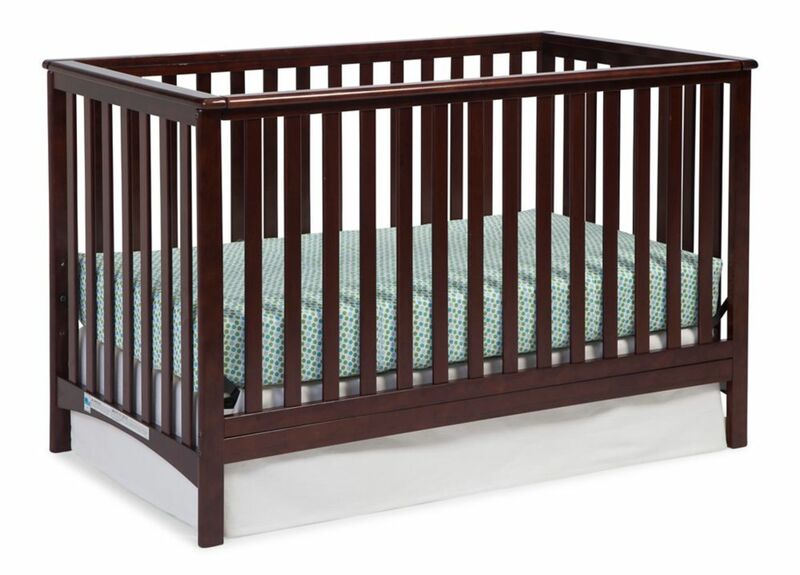 The Graco Maple Ridge 4-in-1 Convertible Crib will add impeccable style and comfort to your baby's nursery. Available in multiple finishes, the Graco Maple Ridge Crib features a beautiful sleigh design and a base trim that surrounds all sides of the crib for a premium look. Featuring a mattress platform that adjusts to three different levels, the Graco Maple Ridge Crib is designed to grow with your child as it converts to a toddler bed (no guard rail), daybed and full-size bed (bed frame not included). The Graco Maple Ridge Convertible Crib is built to meet the industry's highest safety standards and is JPMA Certified and CPSC compliant. This Sweet Lullaby Twin Bookcase Headboard in Espresso finish has been made to meet your child's needs for years to come. This look, which will never go out of style, works well with various types of dicor, so you can change your little one's bedroom to suit his or her tastes without having to think about replacing the furniture. It was designed with both maximum safety and a trendy look in mind, to give you a well ordered and highly practical room, set up to reflect the taste of the times. It creates a pleasant, comfortable space for your child. Furthermore, the large decorative moulding is really confirming its traditional Style. It features 5 open storage spaces with a hole for wire management in centre one. It is compatible with a metal frame (hardware not included). Also available in Pure White finish. It measures 41-inch wide by 10-inch deep by 48-inch high. It is delivered in a box measuring 47-inch by 16-inch by 5-3/4-inch and weighing 46 pounds. This Sweet Lullaby Twin Mates Bed in Espresso finish with matching wooden knobs has been made to meet your child's needs for years to come. This look, which will never go out of style, works well with various types of dicor, so you can change your little one's bedroom to suit his or her tastes without having to think about replacing the furniture. It was designed with both maximum safety and a trendy look in mind, to give you a well ordered and highly practical room, set up to reflect the taste of the times. It creates a pleasant, comfortable space for your child. This bed is reversible so the 3 drawers can be on either side. It doesn't require a box spring and its weight capacity is 250 pounds. The interior drawer dimensions are 22-1/4-inch wide by 17-3/4-inch front to back and equipped with plastic slides. Also available in Pure White finish. New and improved drawer bottoms made with wood fibres. It measures 41-inch wide by 76-inch deep by 16-inch high. It is delivered in a box measuring 85-1/2-inch by 22-inch by 4-1/2-inch and weighing 117 pounds. Hillcrest Crib-Espresso The beautifully crafted Storkcraft Hillcrest Fixed Side Convertible Crib has a modern look and design that is both trendy and functional. Not only does this crib look great but the Hillcrest will grow with your child as it can be converted to a day bed and full size bed providing your child with years full of enjoyment. The Storkcraft Hillcrest crib is made from quality and attractive wood and wood products and will safely fit any standard size crib mattress. This crib also features three height adjustable mattress levels for your convenience. All Storkcraft cribs are JPMA Certified and PTPA (Parent Tested, Parent Approved) Approved.